This rare 45 has reached iconic status in the Northern soul ranks for the Motown sound-a-like “Building Your House On A Strong Foundation”, but the other side has garnered little or no attention. But If It Makes You Feel Good is a stunning piece of deep soul, chock full of emotional strength and passion. The vocals, especially Ray, are everything that could be desired, and the horns bring some splendid weight to the proceedings. 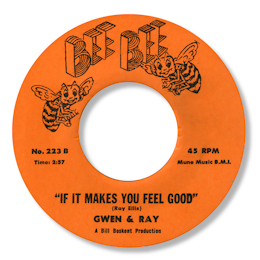 Producer Bill Boskent operated his Bee Bee label out of Washington, DC and the “wah wah” guitar must put the recording date into the late 60s, if not the early 70s. “Ray” may be writer Ray Ellis – but as for “Gwen” I’m none the wiser. Anybody? 1. You can read more about Bill Boskent’s very interesting career here. 2. Beware the bootleggers on this 45!